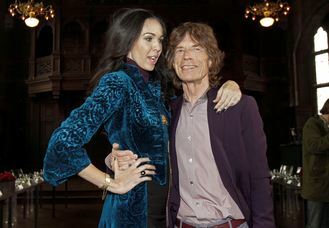 NEW YORK — Mick Jagger has established a scholarship in honor of his late girlfriend, fashion designer L'Wren Scott. The scholarship will allow one master's degree student per year over a period of three years to attend the elite Central Saint Martins, the London-based college announced this weekend. Scott, who committed suicide last March at age 49, had been close to a former course director at Central Saint Martins, the late Louise Wilson. Fabio Piras, the current course director of MA Fashion, says in a statement that he was "very grateful to receive this extremely generous scholarship package." The grant covers tuition and some living expenses. Mark Ronson has said after collaborating with his “hero” Stevie Wonder for his new album, he has been left wondering how to top it. When her debut single "All About That Bass" topped charts in 58 countries last year, Meghan Trainor knew people were thinking of her as a "one-hit wonder" or simply the "Bass" girl. Marilyn Manson used to feel trapped by his public persona. Nick Young Hasn’t Cheated On Iggy Azalea, FYI. Liam Gallagher has "failed" his daughter, according to her grandfather. The news broke on Twitter after the Harlem group's account tweeted "RIP @ASAPYAMS". Well, this is the ultimate '90s throwback lineup. New Kids On The Block will tour with TLC and Nelly this summer, starting in Las Vegas on May 1. Ronan Keating accidentally headbutted the Pope after a performance at the Vatican.